On the outskirts of Karlsruhe, in south-west Germany, engineers have buried a giant, stainless steel device, bigger than a blue whale, inside the town’s institute of technology. The machine looks for all the world like a grounded zeppelin or a buried blimp. 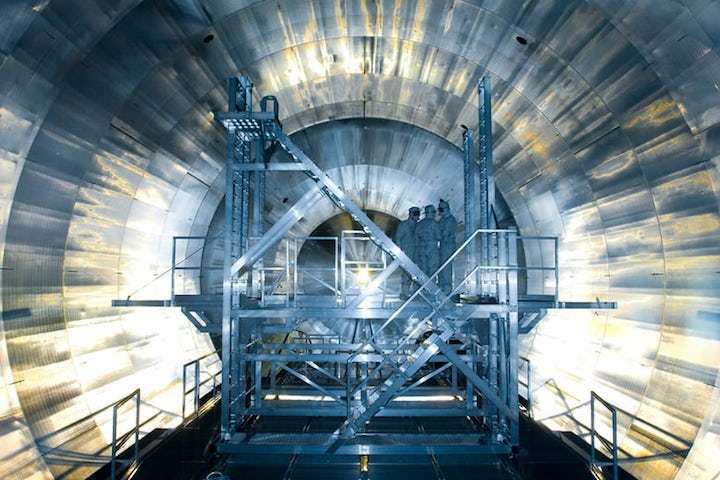 In fact, the apparatus is one of the world’s biggest vacuum chambers. Air pressure inside it is lower than that on the surface of the moon and it has been installed to help solve a single, intricate problem: finding the mass of the universe’s most insignificant entity, the neutrino. Every second, billions of neutrinos pass through our bodies. The sun sends trillions streaming across space every minute. Uncountable numbers have been left over from the Big Bang birth of the cosmos 13.8 billion years ago. In fact, there are more neutrinos in the universe than any other type of particle of matter, though hardly anything can stop these cosmological lightweights in their paths. And this inability to interact with other matter has made them a source of considerable frustration for scientists who believe neutrinos could bring new understandings to major cosmological problems, including the nature of dark matter and the fate of our expanding universe. Unfortunately, the unbearable lightness of their being makes them very difficult to study. Hence the decision to build the Karlsruhe Tritium Neutrino Experiment, or Katrin. It is designed to measure the behaviour of neutrinos and electrons that are emitted by the hydrogen isotope, tritium, in order to uncover slight variations in their paths as they fly through the experiment’s vacuum chamber. These variations should reveal precise details about the neutrino’s physical properties, in particular its mass. It has taken more than a decade of planning and construction to put Katrin together. Its price tag, just over €60m, has been met by the German taxpayer via the country’s state-funded Helmholtz Association, with a further €6m chipped in by US, Russian, Czech and Spanish scientists who will have a minor involvement with the project. Final trials are now being completed and full operations are set to begin in June, though it will take a further five years of gathering data before scientists can expect to have enough information to make an accurate assessment of the neutrino’s mass. The neutrino was first postulated in 1930, by the Nobel physics laureate Wolfgang Pauli, to explain the behaviour of other subatomic particles during radioactive decay. It took a further 26 years of search before neutrinos were first pinpointed in detectors and they remain maddeningly elusive. An illustration of their insubstantial nature is provided by Canada’s Sudbury Neutrino Observatory, where a 1,000-tonne tank of heavy water is used to stop some of the 10 million million neutrinos that pass through it each second. Of these, only about 30 are actually detected in an average day. Three different forms of the particle are now known to exist: the electron neutrino, the muon neutrino and the tau neutrino and until relatively recently it was thought that none of them had any mass at all. They were the ultimate in ephemeral ghostliness, a bizarre situation that was celebrated by John Updike in his poem, Cosmic Gall. However, in the late 20th and early 21st century, scientists started to uncover evidence that suggested Updike was not entirely correct in his claims about the neutrino and that it did have some mass after all. This work culminated in experiments, carried out separately by Takaaki Kajita, from Japan, and Arthur McDonald, from Canada, which showed that neutrinos switch form as they travel across space. For example, some of the electron neutrinos emitted by the sun are transformed into muon and tau neutrinos as they hurtle towards the Earth. The process is known as neutrino oscillation. Drexlin recalls attending the physics conference where the results of these first experiments were unveiled. “It was like a rock concert. People were cheering and stamping their feet – for a good reason. We knew the universe would never be the same again.” For revealing the neutrino’s massive secret, Kajita and McDonald were awarded the Nobel prize in physics in 2015. For example, if neutrinos prove to be on the heavy side of current estimates, then their combined gravitation pull would effect the expansion of the cosmos and slow it down. However, if their mass is on the light side, neutrinos, despite their cosmological ubiquity, will be unable to act as any kind of meaningful brake to the universe’s expansion. Since then, measurements, carried out in Mainz, Germany and Troitsk in Russia, have pushed this figure further and further downwards with the result that the upper limit for the neutrino mass is now put at around a mere 2 ev, about two billionth the mass of the lightest atom. It will be the task of Katrin finally to nail down a precise figure. This work will be carried out using a small supply of tritium, an isotope of hydrogen that has two neutrons and a proton in its nucleus. (Normal water has no neutrons in its nucleus.) Tritium is made in nuclear reactors and is extraordinarily expensive. “A gram costs about €10,000 so you do want to be careful with stuff, particularly as it is also highly radioactive,” says Drexlin. It is this last feature – tritium’s radioactivity – that makes it crucial to Katrin. 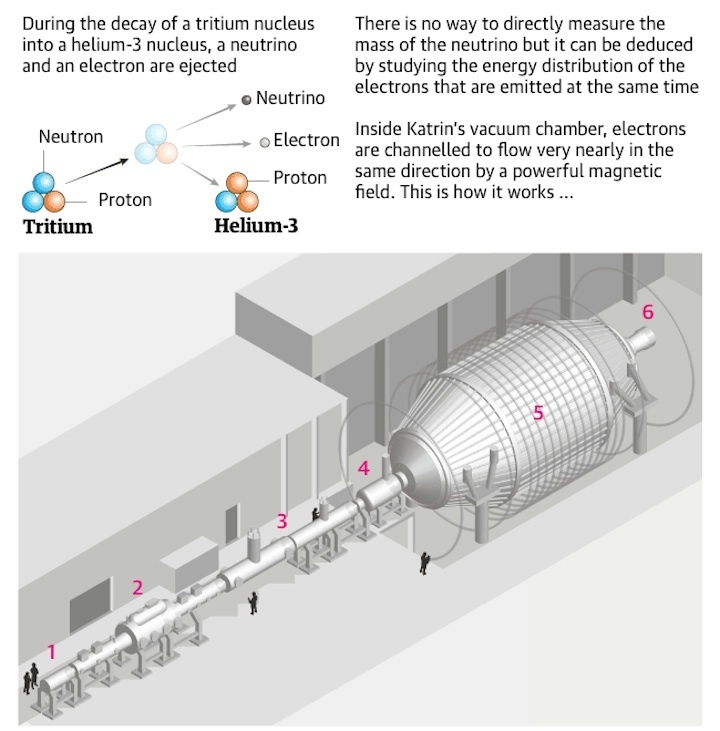 Tritium decays into an isotope known as helium-3 by emitting an electron and a neutrino. By precisely measuring the energy (and therefore the mass) of the electron as it flies away from its tritium source it should be possible to deduce the energy (and mass) of the neutrino that is emitted with it. Superconducting magnets will generate a field 70,000 times more powerful than Earth’s and channel the electrons into Katrin’s great vacuum chamber towards a powerful electric field. Only those electrons that have the most energy will be able to get past that field and be counted. These will be the electrons that have taken almost all of the energy from their decay from a tritium atom while the neutrino will get none. About one in every 5 trillion electrons created by the tritium will have this feature. “These electrons will take up all the kinetic energy of that aspect of the decay of the tritium nucleus,” says Drexlin. “The neutrinos that are emitted will get none. All that will be left in the equation will be the mass of the neutrino that was emitted with the electron. By taking very careful measurements, it should then be possible to calculate what is that exact mass. 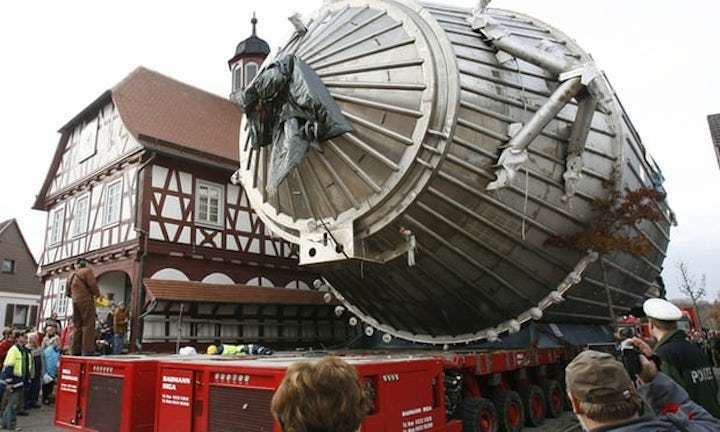 The voyage that brought Katrin’s main component – its giant, 23-metre-long, 10-metre-wide vacuum chamber – to Karlsruhe remains one of modern engineering’s strangest odysseys. Built in nearby Deggendorf, 150km north-east of Munich, the 200-tonne, zeppelin-like chamber was too large to be taken on the 400km westward journey directly to Karlsruhe, either by air or road. So engineers were forced to take to the water, which in turn obliged them to head east down the Danube before sailing into the Black Sea and then the Mediterranean, across the Bay of Biscay and the Channel to Rotterdam. Finally, it was taken down the Rhine to bring it close to Karlsruhe. The 8,800-km trip took two months. “It was dubbed Europe’s biggest detour and you can see why,” says Drexlin. It was also an eventful excursion. 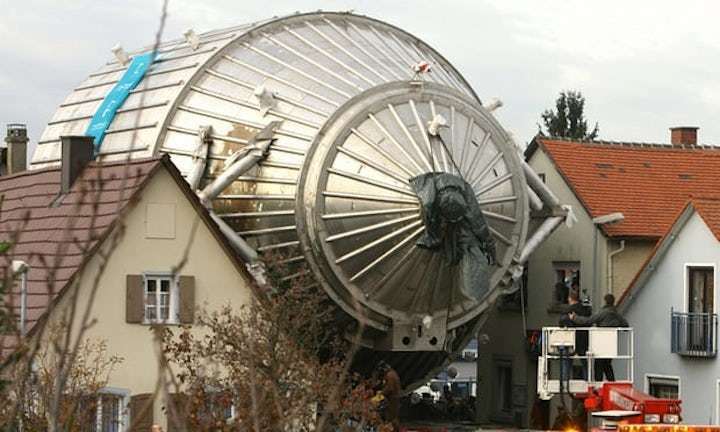 In September 2006, not long after the ship carrying the vacuum chamber had set off, it was found its cargo was actually too light to keep the boat low enough in the water and so allow it to pass under the bridge that crosses the Danube at Jochenstein. “We had to buy 1,000 tonnes of rock and gravel to weigh it down so we could get under the bridge,” Drexlin recalls. Eventually the chamber reached Rotterdam and was then taken up the Rhine, which was by now at its lowest level for decades. “We only scraped over the river bottom by centimetres this time,” says Drexlin. This final stage of the chamber’s journey also proved to be the most nerve-racking. “At some points, there was a clearance of only 3cm between the chamber and the town’s buildings,” adds Drexlin. The sight of the great machine scraping its way through the town is extraordinary: a spectacle eerily reminiscent of a Hollywood alien invasion film.